Reading and share top 12 famous quotes and sayings about Impartiality by famous authors and people. Browse top 12 famous quotes and sayings about Impartiality by most favorite authors. 1. "In carrying out a peacekeeping mission where the grand strategy is to maintain peace and order by persuading armed parties or other hostile elements to back away from aggressive activities, military strength is not a definite measure of success; neither could material contribution alone guarantees the "winning of the hearts and minds" of the people. What appears to be important is the day-to-day conduct of the peacekeepers on the ground; those who uphold the principles of neutrality and impartiality, as well as those who are able to carry all aspects of its operational duties exceptionally." 2. "It is well, when judging a friend, to remember that he is judging you with the same godlike and superior impartiality." 3. "Love is Compassion, Endurance, Equanimity, Impartiality, Magnetic, Patient and Just (and Where Justice Is Not, Hate-Traders Profit)"
4. "Impartiality is incompatible with the will to affirm oneself or quite simply with the will to exist. To acknowledge another's merits is an alarming symptom, an act against nature." 5. "What people call impartiality may simply mean indifference, and what people call partiality may simply mean mental activity." 6. "Impartiality is a pompous name for indifference which is an elegant name for ignorance." 7. 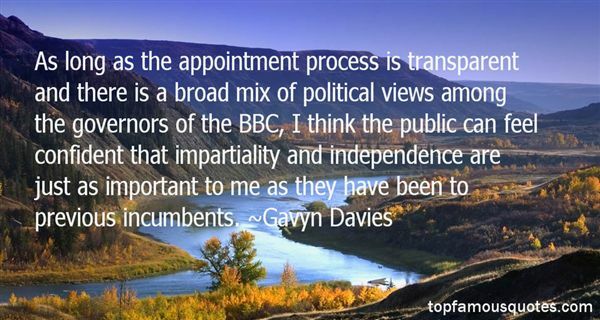 "As long as the appointment process is transparent and there is a broad mix of political views among the governors of the BBC, I think the public can feel confident that impartiality and independence are just as important to me as they have been to previous incumbents." 8. "Thanks to the high standing which science has for so long attain and to the impartiality of the Nobel Prize Committee, the Nobel Prize for Physics is rightly considered everywhere as the highest reward within the reach of workers in Natural Philosophy." 9. "The sea slapped ominously, confessing its strategic impartiality. 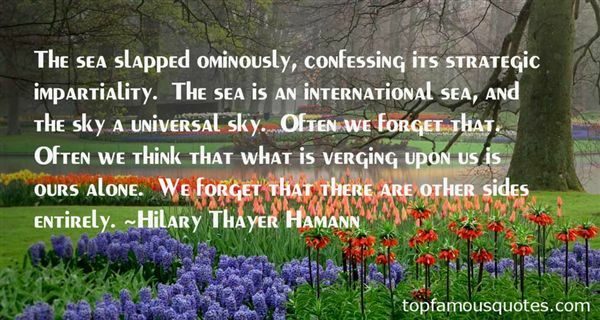 The sea is an international sea, and the sky a universal sky. Often we forget that. Often we think that what is verging upon us is ours alone. We forget that there are other sides entirely." 10. "Impartiality is to accept that we are partial." 11. "Such bureaucrats can neither be hurried in their deliberations nor made to see common sense. Indeed, the very absurdity or pedantry of these deliberations is for them the guarantee of their own fair-mindedness, impartiality, and disinterest. To treat all people with equal contempt and indifference is the bureaucrat's idea of equity." 12. "The Ladies Buddenbrook from Breite Strasse did not weep, however - it was not their custom. Their faces, a little less caustic than usual at least, expressed a gentle satisfaction at death's impartiality." Your life can be different, Young Ju. Study and be strong. In America, women have choices."